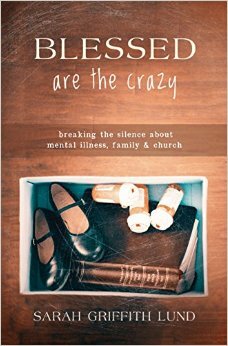 Blessed are the Crazy: Breaking the Silence about Mental Illness, Family and Church by Sarah Griffith Lund, Chalice Press, 2014, 116 pp. This book is brave. Sarah Lund commits from the very beginning to testify–to bear witness to the heartache and struggle of her own life and where God has (and hasn’t) been present and active in it. Then she follows through, confessing to her own pain, the pain of her family, and stories of brokenness and hope. Her vulnerability as a writer, pastor and person left me humbled and challenged to pursue that kind of testifying in my own life and ministry. Before the book even begins, there is a definition offered for “crazy in the blood,” referring to the genetic predisposition to brain disease and “why some families are more dysfunctional than others.” This is Lund’s family and her story. She begins in her own voice as a five-year-old child, recalling a story of violence from her father after church. Her testimony unfolds through her teen and young adult years, as her father’s violence and mental illness unravel his life. Even as a local church helps her to know that “not everything in my life was ruined,” (7) Lund feels as though a God of love cannot reside in a home filled with such hate, and that faith and hope are set out to sea. She finds faith renewed in her college years, along with the perspective to understand her father’s violence as an illness. After her years as a child and youth, her testimony turns to a faithful wrestling with how to love members of her family whose mental illness risks destroying their lives, and hers along with them. It is not just about her father. Her eldest brother is diagnosed with bipolar disorder, and she comes to care for a cousin on death row for a murder likely triggered by untreated mental illness and family abuse. It is painful to read, but her truth-telling is healing and liberating. While I am not subject to the pain of Scott’s illness, I can recognize my own relationship with God in his description. I too find myself thinking that I am god-like when I feel strong and capable, just as I doubt God’s existence when I falter and fail. Healing is a word that Lund uses carefully and sparingly. Mental illness has no cure. Though it can be managed throughout life, it will again and again flare up to cause damage and distress. She uses the powerful metaphor of bearing the cross. Subsequent chapters challenge social notions (and Christian ones) about people with mental illness. She talks about the execution of her cousin and crushing power of state-sanctioned murder. She asks, “if God was with Paul and in Paul, what happened to the God-part of Paul when he was executed? Did part of God get executed too?” (68) Her answer–that “part of me and part of God died the night of Paul’s execution”–indicts our whole system of “justice.” A similar indictment follows as she talks about a kind of Christian faith that believes faith and prayer are sufficient alone to combat the brain diseases that her family has suffered, or that they suffer due to insufficient faith in God. Instead, Lund offers a better, more compassionate way for churches and Christians to journey with people with mental illness and their families. She evokes a theology of suffering, where mental illness is neither a blessing nor a curse, but a situation in which God enters to accompany humans in their suffering. As people of faith, we should join God in that faithful, compassionate work of accompaniment. The book concludes with practical suggestions for churches about how to begin those kinds of ministries. At first, what stands out most about Blessed are the Crazy are the personal stories, whose vivid drama draw attention and stick in the reader’s memory. But the book matters not just for its storytelling, but for the theology of suffering and God’s persistent love in the midst of it, and for the challenge to people of faith to live out that love by walking together with those who are suffering from “crazy in the blood.” This book is a gift to all clergy, to families seeking hope in mental illness, and to church communities seeking to respond. 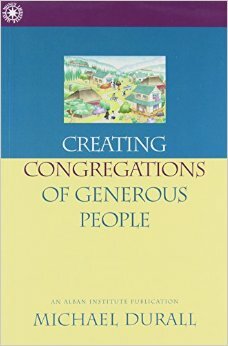 Creating Congregations of Generous People by Michael Durall, Alban Institute, 1999, 104 pp. I’ve been reading a lot of book about stewardship lately, as my congregation is struggling to learn and grow in this area. Michael Durall’s book was cited by several others as an important resource. It is no longer in print, but I found a copy easily at half.com for less than a dollar. I was surprised by the tone of this book, from the beginning. Most stewardship experts write in a way that is frank, but relentlessly encouraging. They seem to say, “You’re doing it wrong, but if you do these things, you’ll be rich!” Durall has all the frankness, but a much less cheery outlook–while maintaining that congregations can create generous people and provide ample resources for their ministry. Durall backs this up with experience and research. He counters the dictum that “money follows mission,” common in so much of the literature, including the popular J. Clif Christopher books. He names the deep intransigence of a church’s giving culture, and the sustained effort required to transform it. While he does agree that people should be encouraged to give to God and not to church, that we need to be emphasizing mission, he does not think this is enough to overcome longstanding patterns of same-level and low-level giving. Durall instead invites us to nurture the trait and spiritual discipline of generosity throughout our churches. The remaining chapters offer some practical advice and exercises, some of which are familiar (like not encouraging giving to the budget) and some of which were new to me. I found his advice to ministers especially helpful. While he agrees with J. Clif Christopher that ministers should know what people give, Durall assumes they probably will not, and that makes his guidance most helpful. He says that the minister should “introduce the importance of stewardship to the congregation at the earliest opportunity,” which is best accomplished by making a leadership gift and sharing that intent with the church, even before a call is issued. (49) I love this idea. He adds to the minister’s list: stressing the importance of giving to new members, encouraging a mentality of abundance over scarcity, setting vision and clarifying roles, and including stewardship in worship regularly–especially by finding ways to thank people. Durall’s concrete advice about stewardship builds upon his realistic assessment of congregational giving culture, his claim that we are to be building generous people, and a commitment to year-round stewardship. Though it is older, Durall’s book offered new ideas and perspectives that I have already shared with my Stewardship Team and we are finding ways to use in our congregation. Some might find his less-than-optimistic read on giving cultures depressing, but I found it honest and helpful. I think this is a worthwhile addition to every pastor’s stewardship library.